Werner's Cairns blog: Cairns, the jewel of tropical North Queensland, Australia. Cairns, the jewel of tropical North Queensland, Australia. If you want to go to paradise, then Cairns, the heart of Tropical North Queensland should be your destination. Cairns is a vibrant city, and the place where the Rainforest and the Great Barrier Reef meet. 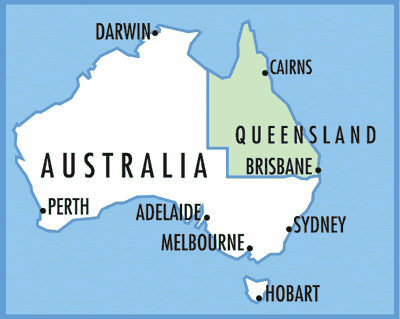 Queensland is known as the Sunshine State. But North Queensland claims the bulk of the sunshine, combined with a blue sky, a balmy tropical climate, laid-back ambience, friendly people and an evergreen landscape all year round. Click map to enlarge. The World Heritage listed Wet Tropics Rainforest, Great Barrier Reef and the Outback are all within easy reach. Cairns is surrounded by the spectacular rainforest mountain ranges and the sparkling water of the Pacific Ocean. Watch this interesting Great Barrier Reef Video. Click here. The Cairns Esplanade is the city's most popular attraction with a lovely oceanfront promenade, saltwater swimming lagoon and beach. You'll find numerous restaurants, bars and hotels lining the Esplanade... all offering beautiful waterfront views. Thousands of visitors flock to the Esplanade to enjoy the alfresco dining and relax in the beautiful surroundings of this modern city. Cairns pictures, click here. Kuranda, the rainforest village, 20 minutes by car from Cairns, is often referred to as the “air-conditioned suburb of Cairns” and can be reached: 1. by car via the Kennedy Highway and the picturesque the Kuranda Range starting at Smithfield. This is also the gateway to the beautiful Atherton Tableland, only a “kangaroo jump” from Cairns, with many of its own natural attractions. It is the food bowl of North Queensland with dairying, coffee growing, tropical fruit, vegetables, peanuts, corn, and sugarcane, just to name a few. As a matter of interest, potatoes are harvested three times per year. In certain areas they can get frost in winter (May to August) and temperatures have been listed as low as 9 degrees Celsius below zero. However during the day temperatures range between 16 to 22 Celsius. Click here, and here.http://atherton-tableland.com/ for more information. 2. By Skyrail. This is the world’s most beautiful rainforest experience. The Cableway spans 7.5kms over pristine rainforest, allowing you to explore the wonders of an ancient tropical rainforest and learn about one of the most botanically fascinating and diverse areas on earth. Click here. 3. The Kuranda Scenic Railway from Cairns, which snakes its way up along the edge of the Macalister range above the Barron River Gorge, going through 19 tunnels and over bridges on this magnificent journey, passing Stoney Creek and the Barron Falls; before reaching the Kuranda Railway Station. Explore the past and enjoy the present on the wonderful Kuranda Scenic Railway. The world famous railway experience is a must-do when visiting Cairns and Tropical North Queensland, Australia. You will discover the pioneering history of the tropical north from way back in the late 1800's, be astounded by a magnificent engineering feat and explore some of the great characters involved in the construction of this great railway. The Kuranda Railway station is adorned with tropical ferns and other interesting plants. Click here. Other points of interest include a trip along the picturesque Captain Cook highway, which starts on the Barron River Bridge just north of the Cairns airport. The highway, in one section, snakes for 22 Km along the base of high mountains on one side and the Pacific Ocean on the other, and must not be missed. Port Douglas, the Mossman Gorge; the Daintree village and Cape tribulation at the end of the line are places worthy of a visit. The Cairns Visitor Centre. Click here! Come to Cairns, and have the best time of your life. Posted by Werner Schmidlin at 5:44 PM Labels: Cairns Qld. Good on you Werner! !If everyone did their bit we would be inundated with Tourists. That would put a smile on everyone’s face... well most faces anyway ..
We really appreciate that you are promoting Cairns, and North Queensland. You are right; we are doing it tough in Cairns at the moment. Thank you for this excellent posting. This is very good of you to get the message out for our beautiful region. Is it possible to put in a link to www.cairnsvisitorcentre.com on you site for those who need information or help?